There are a lot of things, like traffic and tornadoes, to dislike on this great planet we like to call Earth. One of the vilest things that I can think of are bugs. They can turn a truly spectacular day into a perfectly horrible dumpster fire of grandiose proportions. I’m not talking about spiders, flies, or mosquitos. While they are awful, the types of bugs I can’t stand are the ones that represent errors in my code. I can be typing away, creating what I believe to be an excellent piece of software only to have the quality control hammer of death assign me a bug to fix. Sad clown face. 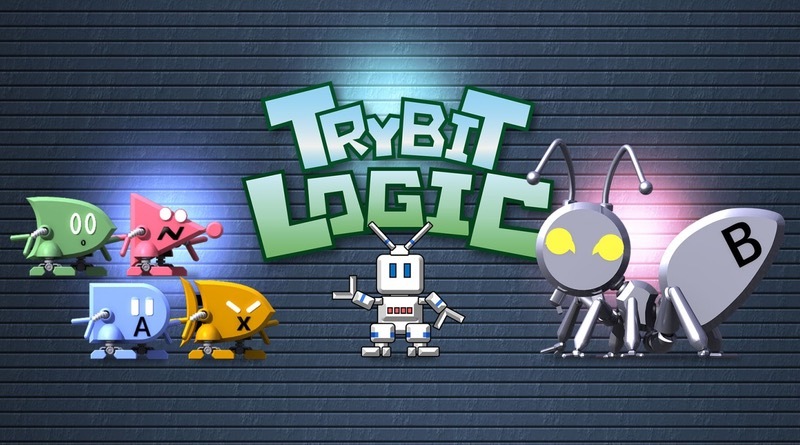 Trybit Logic is a game that will have you killing these vile creatures for a little robot whose name is Bitrobo. While it’s not as cool of a name as Astro Bot, we can be nice to him because his mother might’ve been a dishwasher or Rosie from the Jetsons. Who knows? Either way, he is begging for our help to destroy them and by gosh by golly we’re just the type of humans to lend him a hand! Bugs are represented in the game as ants. Ants don’t seem that dangerous, but truly they are evil incarnate. Watching nature shows that illustrate their destructive behavior will have you whipping out your magnifying glass on the weekend and paying them back for their crimes. I digress. We are talking about bits within a computer. A bug in Trybit Logic is any bit that isn’t either all ones or all zeroes. Your job is to use the tools that Bitrobo gives you to change these bits to eliminate the bugs. One of these tools is call OR. This takes 0101 and 1010 and converts it to 1111. Wait, that might be AND. I know it isn’t NOT. Although it might be. Listen, it’s a little confusing to explain and Bitrobo does a MUCH better job than I can during the tutorial levels. Since the game boasts 200 puzzles, you will have plenty of time to get the hang of it. This puzzler is definitely best suited to be played on the touch screen of the Switch. I did try it on the TV but I got super tired of using the left stick to move a hand to click and drag the tools onto the bugs. Even moving through the tutorials wasn’t done by hitting A or anything, it was by hitting the >> icon to move through it. Since it has been released on smartphones for almost a year, it makes sense that it would be best played on a touch screen. I would have liked for them to give a little more thought to the Switch player than they really did. I didn’t like moving this little hand around and was pulling the Switch out of its base to use the touch screen within 5 minutes of playing. The characters are fairly bland and aren’t all that imaginative, but they don’t really need to be. A bug is an ant, OR is a thing, NOT is another little thing. I didn’t really care since my brain was actively trying to solve each puzzle the second it came up. They have a sweet feature I loved on the left side of the screen which allowed you to back up to any previous move you made or start over. There were many times where it was nice to realize that you screwed up about 3 moves ago and you don’t have to just hit replay to try again. You CAN hit replay to start over, but that’s the beauty of it. Go back as far as you need to in order to get your five star rating for squashing all of the bugs. What’s more, you can skip a puzzle to move to the next one, ask for a hint, or just quit altogether if you so choose. Trybit Logic is a fun and unique puzzle game for the Switch and is better played on the go. It really gets your logic juices flowing in your brain. If you’re anything like me and enjoy good puzzle games, this one should challenge your cerebral cortex. Trybit Logic is a fun puzzle game that plays best when using the Switch’s touch screen. While it does play ok on the TV, I found it cumbersome and annoying to move the cursor around the screen. Plenty of puzzles will give you hours of bug-crushing fun and possibly a few brain cramps. Jay has been an avid gamer since the Intellivision days. His hobbies include building PCs, 3D modeling and printing, and spending time with his children and dog. E3 will be like recent years with a video presentation. Pokémon Sword & Shield, Luigi’s Mansion 3, Animal Crossing & Zelda: Link’s Awakening all still scheduled for 2019.